More than half of the top 100 US retailers last year began testing beacons, a real-time, proximity marketing tool, according to a Business Insider Intelligence study from last August. One in three of those testing beacons are expected to be installed by the end of 2015, and 4.5 million active beacons will be set up by 2018, with 3.5 million of these in use by retailers, the study adds. "Out of the major retail chains, you would be hard pressed to not see someone at least talking about beacon technology or testing it right now," says National Retail Federation SVP and Shop.org executive director Vicki Cantrell. Beacons are miniscule devices that can be placed on a wall to communicate with consumers through apps on their smartphones via Bluetooth signals. And test results are proving positive. After a pilot run during the previous year’s holiday season at Macy’s flagship stores in New York and San Francisco, the retailer expanded use of beacon technology to all stores nationwide in fall 2014. "Macy’s has an omnichannel strategy, which is defined as allowing our customers to shop whenever, however, and wherever they prefer," says Jim Sluzewski, Macy’s SVP, corporate communications and external affairs. "We are taking our cues from customers and beacons are a new technology that is helping us to do that." During the initial phase of the Macy’s program, consumers who have opted in to receive app notifications will receive promotions, deals, or discounts toward the retailer’s products. "As we work through the capabilities of beacons and find out what resonates with customers, that will give us the ability to be much more granular," Sluzewski says. He adds that Macy’s wants to get the technology to the point that if a customer approaches a display of KitchenAid mixers, for example, a promotional message for that product will pop up on their phone enabling them to link into a video of the attachments available for the mixer or a recipe for making cookies with it. "We will be working with our branded vendors on those kinds of opportunities," Sluzewski adds. But the technology isn’t just for retailers. Marketing teams behind stadiums, airports, restaurants, museums, hotels, malls, and events are also starting to see the benefits of beacons. Last September, the Miami Dolphins became the first NFL team to fully integrate beacon technology within an app. The Dolphins are using beacons to help fans locate restrooms and food services within the stadium, alerting ticketholders about offerings within their proximity, and pushing out videos about the team’s history to those standing near key locations, such as a statue of former Dolphins player Dan Marino. "Ultimately, we want to be able to streamline the experience of our fans by providing them with services and amenities to enable them to enjoy a game, conference, or event at our stadium," says Tery Howard, SVP and CTO for the Dolphins and Sun Life Stadium. "We also want to make sure fans have an understanding of all our offerings." Between April and June 2014, Hillshire Brands ran a national campaign in top grocery chains using beacon and geofence tech to drive sales and awareness around its new American Craft Link Sausages product. When walking into a beacon-enabled store, shoppers were alerted with messages specific to their favorite app. When consumers interacted with apps, custom product engagements were triggered. Alerts enabled shoppers to add products to their list or earn coupons for purchases. Within the first 48 hours, the campaign achieved 6,000 instore engagements. Final results showed a 36% increase in brand awareness and a lift in overall sales for American Craft. There was also a 20% increase in purchase intent by those who received the messages, according to a Hillshire case study. Aside from influencing consumers at the point of sale, app company Ion Interactive’s cofounder and CTO Scott Brinker notes that beacons can help reduce the costs of acquiring customers by enabling marketers to better target the right kind of shoppers and "more efficiently nurture them through the buyer’s journey." "Beacons can also help with consumer retention and loyalty by giving them the channels and insights to have helpful interactions with customers beyond just the moment of purchase," he adds. Moreover, retailers can see a person’s reaction to a particular offer, sale, promotion, video, or photo in real time. But to fully leverage the technology’s potential, marketers must be aware of its limitations. Only consumers who have the app installed and have opted in to receive push notifications and information, for example, will be able to receive messages via beacon. The technology also may not work on every interactive device. "Beacons aren’t a mainstream way of reaching shoppers," says Forrester Research VP and principal analyst Thomas Husson, "but they provide a way to push consumer engagement a step further." Once the technology’s reach is established, the messages it sends to customers must be personalized, relevant, and contextual, or it runs the risk of being perceived as spam, potentially damaging the brand. Brands using beacons must also clearly communicate data and privacy policies to consumers as part of their marketing strategy. "Smartphones are the most personal devices we use," he adds, so marketers need to be clear about the data they will and will not use." The Dolphins’ beacon technology, for instance, is activated when fans download the team’s app. But before location services are turned on, users are asked a series of questions to ensure they understand it will provide them with notifications and promotion services. Users can turn the location services off at any time. 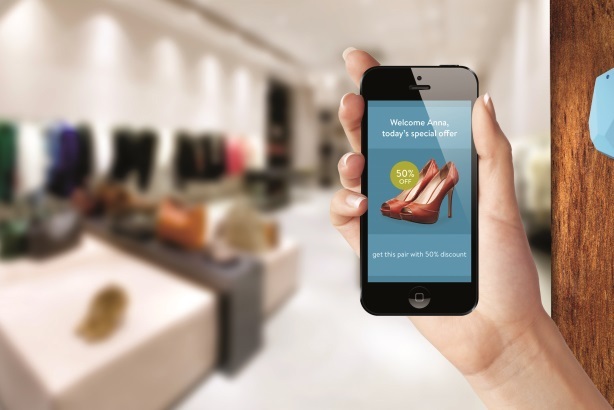 As with any new technology, companies integrating beacons into their marketing strategy must communicate with the public about the devices themselves. A misunderstanding in October 2014 led to the removal of 500 beacons that outdoor media company Titan had placed in phone booths in Manhattan. The Department of Information Technology and Telecommunications had initially agreed to the installation without a formal approval process because the firm said it was using the devices for maintenance purposes only. But following a BuzzFeed report about the beacons potentially turning the city into a "giant matrix of hidden commercialization," the department demanded their removal, citing that prior written approval from the city is required for any new payphone advertising formats. "The department misunderstood that we were trying to establish whether beacons – largely used inside buildings – could work in a city such as New York," says Dave Etherington, Titan EVP and chief strategy officer. Going forward, Titan is working with its transit authority and municipality partners on being as explicit, open, and transparent as possible about telling the public via media relations why there are beacons present and how to interact with them, he adds. Last summer, American Eagle Outfitters offered customers rewards through push notifications on Shopkick’s app for using their fitting rooms. Customers who received the offer were more than twice as likely to try on clothing as those who didn’t. In total, more than 10,000 customers took part in the trial. Virgin Atlantic is using beacons to target passengers with iOS devices in its upper class wing at Heathrow Airport in London. The beacons enable travelers’ boarding passes to appear on-screen automatically at the checkpoint. The airline said it hopes to eventually deliver boarding gate location or amenities on a map or in-flight entertainment options to passengers. In addition, the beacons, which come with a thermometer and accelerometer, potentially could notify Virgin’s staffers to temperature changes so they can react accordingly to make passengers more comfortable. Marriott International launched its LocalPerks push-messaging program using beacons at three Marriott properties last summer, before rolling it out to another dozen US hotels in November. Guests who download the app receive a welcome message upon entering the lobby as well as exclusive hotel incentives inside the properties, such as a free drink. This article first appeared on prweek.com. Will beacon technology ever be a good fit for healthcare?